Prime Rib Roast with Balsamic Glaze is another great Prime Rib Roast recipe that you will want to try! The Prime Rib Roast is a classic and tender cut of beef taken from the rib primal cut. Learn how to make the perfect prime rib roast to serve your family and friends. Check out What’s Cooking America’s award-winning Classic Prime Rib Roast recipe and photo tutorial to help you make the Perfect Prime Rib Roast. You could use this delicious Balsamic Glaze with any cut of beef roast you desire as it is so easy to make and so delicious. This glaze is made using Faux Aged Balsamic Vinegar. Chefs have learned to do as the Italians do – reduce your inexpensive balsamic vinegar with a little brown sugar to make Faux Aged Balsamic Vinegar. Fortunately I have an easy recipe to recreate this at home if you have the ingredients. Learn how to make Faux Aged Balsamic Vinegar. 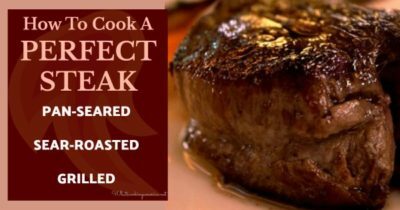 Important: Before beginning this recipe, please read my web page on purchasing, preparing, and cooking perfect Classic Prime Rib. Preheat oven to 350 degrees F. Let roast stand at room temperature for 1 hour. In a small saucepan over medium-high heat, boil balsamic vinegar until it reduces to 1/4 cup, approximately 3 minutes. Remove from heat and set aside. Finely mince the parsley. Mix together with the minced garlic, 1/4 teaspoon salt, and a generous amount of pepper. Using the tip of a sharp knife, bore 7 to 10 narrow holes, each about 1 1/2" deep, in the rib roast. Fill the holes with the parsley-garlic mixture. Spread any remaining mixture over the surface of the roast. Sprinkle all sides of the meat with salt and pepper. Place the roast, ribs down in a roasting pan. Roast for 15 minutes. Reduce oven temperature to 325 degrees F. and continue to roast an additional 2 to 2 1/2 hours or until the internal temperature reaches desired temperature on a meat thermometer (see below). What constitutes rare and medium-rare cooked meat? To satisfy government home economists, the Beef Council says rare beef means an internal temperature of 140 degrees F. Well, that is ok if you like well-done and dry meat. If you like moist, rosy meat (like I do), rare begins when the internal temperature registers 120 degrees F. and starts to become medium rare at 125 or 130 degrees F. To cook your meat properly, you must purchase and use a good instant-read digital >meat thermometer. Remove from oven and transfer onto a cutting board; let stand 15 minutes before carving (the internal temperature will rise 5 to 10 degrees after it is removed from the oven). Pour off all but 2 teaspoons fat in the roasting pan. The pan juices should be few but concentrated and caramelized. Place the roasting pan over two (2) burners on high heat. Add the water, scraping up all the browned bits on the bottom of the pan and stirring until they are incorporated. Boil the liquid until it reduces to 3/4 cup, approximately 3 to 4 minutes. Stir in enough of the balsamic glaze to create a tart edge in the flavor of the juices, approximately 1 to 2 tablespoons. (Reserve any extra glaze for another use.) Add the Worcestershire to the sauce; remove from heat and keep warm. After slicing the roast, add any accumulated meat juices to the balsamic sauce. Serve the meat slices on warmed plates with balsamic sauce on the side.